SINGAPORE - Singapore's economic prospects have softened since the start of this year amid a sharp fall in oil prices and global financial market volatility, the Ministry of Trade and Industry (MTI) said on Wednesday (Feb 24). However, it reiterated an earlier forecast for growth to come in between 1 and 3 per cent this year. MTI said the global economy should recover gradually this year, but manufacturing, which makes up a fifth of the Singapore economy, is expected to stay weak as demand for exports remains depressed. This is due to the slowdown in China, as well as companies in the United States and China increasingly sourcing domestically instead of importing from Asia. Lower oil prices have also weakened prospects for new rig orders in the marine and offshore industry, and heightened the risks of cancellations of existing orders. 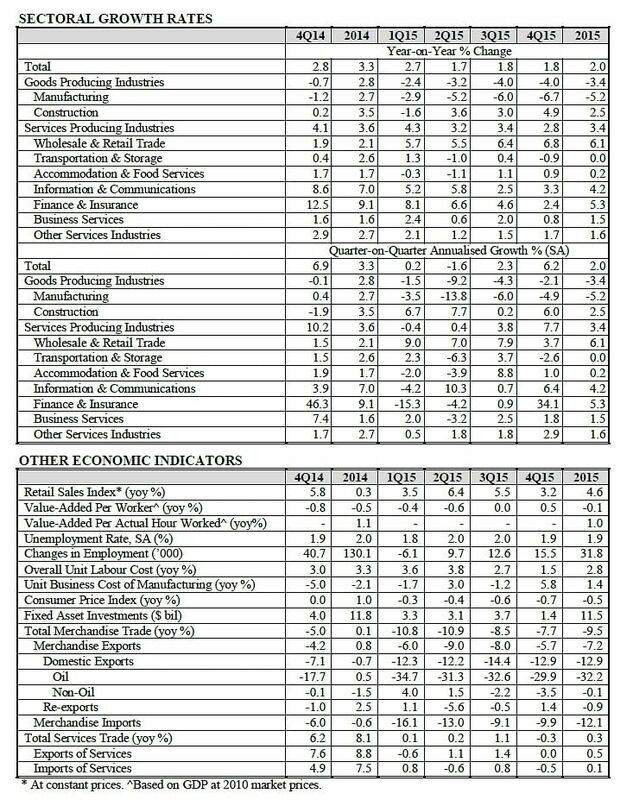 MTI put out these forecasts alongside the release of data showing the Singapore economy grew a modest 2 per cent in 2015, the weakest rate of growth since 2009. This was down slightly from the Government's earlier estimates of 2.1 per cent, and also slower than 2014's 3.3 per cent. MTI also released growth figures for the last three months of 2015, which showed the economy expanded 1.8 per cent in the fourth quarter. This was down from the Government's advance estimate of 2.0 per cent growth released on Jan 4 and matched the median forecast in a Reuters poll of economists. 2015's GDP performance was the weakest performance since 2009, when the global financial crisis shrank economic output by 0.6 per cent. Private economists say growth in 2016 will probably slow to 1.8-2.0 per cent. Compared to the third quarter, the economy in the fourth quarter grew a better 6.2 per cent on an annualised basis in the October-December quarter, extending the 2.3 per cent growth in the previous quarter. The initial estimate was for 5.7 per cent growth. The manufacturing sector, which has been hit hard by lacklustre global trade, was the main drag on growth last year. It contracted 5.2 per cent, a sharp reversal from a 2.7 per cent expansion the preceding year. All manufacturing clusters except chemicals experienced sliding output, MTI said. Growth in the services and construction sectors also moderated from a year ago. "Global growth for the whole of 2016 is now expected to be only marginally better than in 2015," said MTI. "Growth for the year is expected to be supported by strengthening growth in the advanced economies, even as conditions in the emerging markets remain challenging." "Taking into account the above factors, and barring the full materialisation of downside risks, the Singapore economy is expected to grow at a modest pace of 1.0 to 3.0 per cent in 2016."